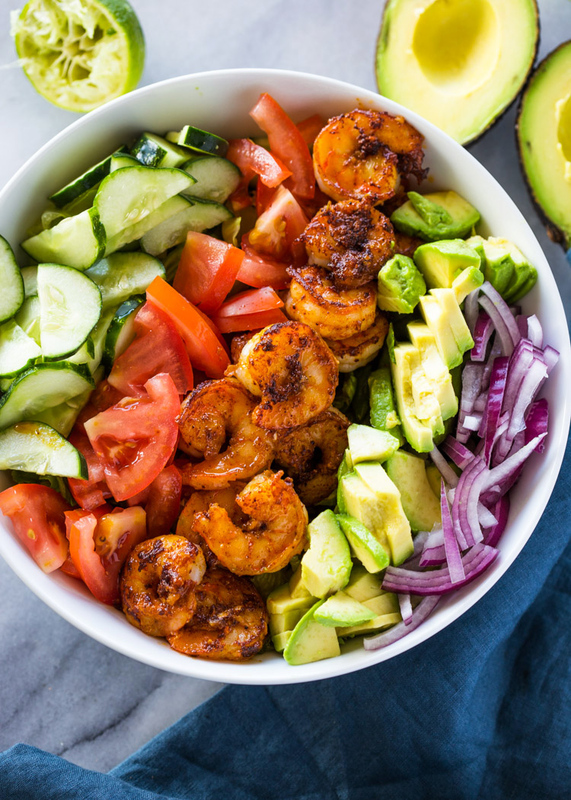 A healthy, flavorful and balanced shrimp, avocado, tomato and cucumber salad topped with a cilantro lime dressing. Shrimp + Avocado is a combo that is out of this world. 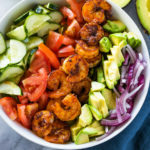 Avocado is great with anything really, but if you’re a lover of avocado, then you’re going to fall in love with this skinny avocado and shrimp salad. The salad is loaded with tomatoes, cucumber, avocado and tender and crispy pan seared shrimp. What takes this salad to the next level is the lip-smacking cilantro lime dressing. 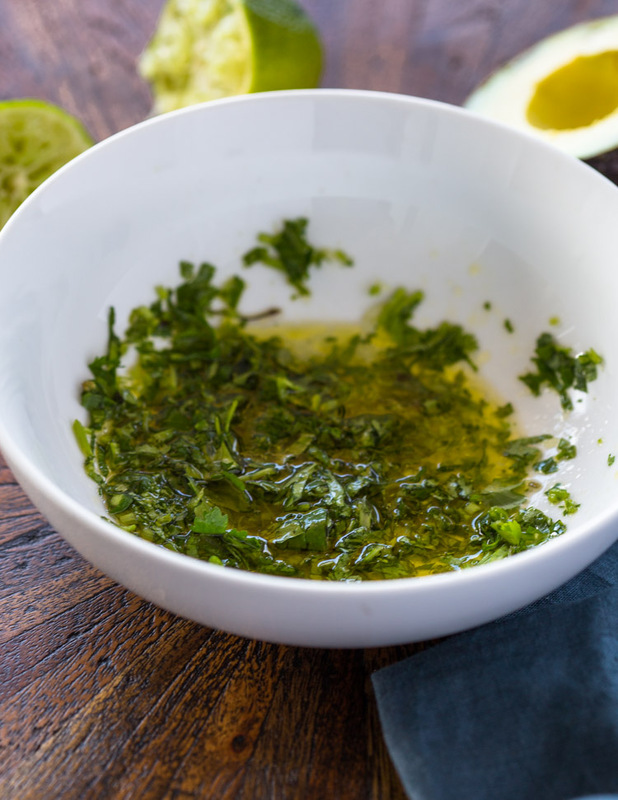 The dressing is simply a mixture of minced cilantro, lime, olive oil, and seasoning. The zesty flavor of the lime and cilantro go great on the avocado and shrimp and help keep the avocado green and vibrant. The secret to making your shrimp crusty and spice packed like the image below is taco seasoning! you can use a home-made blend but I find that the store bought (low-sodium) packets make the shrimp extra crispy! In a medium bowl, combine the shrimp, taco seasoning, garlic, and olive oil. Stir to combine. HEat a large heavy duty pan to medium-high heat. Add the shrimp to pan and cook for 2-3 minutes per side or until cooked through. Remove from pan. To make the dressing, in a small bowl, whisk together dressing ingredients. Add the chopped romaine to a large salad bowl. Top with the tomatoes, cucumber, onion, avocado, and shrimp. Drizzle with the cilantro lime dressing and mix to combine. Serve immediately. If you name a recipe with “skinny” in the title, IMO you should also post the calorie count. Do you have one for this recipe?